TIAL-L is a heat-shrinkable tape for corrosion protection of straight pipes, bends and fittings in conjunction with cathodic protection. The tape is elaborated for installation in field or factory conditions. Operation temperatures up to +60°C.TIAL-L is certified according EN 12068 standard, class C UV. The tape is applied onto the pipe surface by spiral wrapping with overlap on adjacent tape turns. TIAL-L has a two-layer structure (polyethylene backing and hot-melt adhesive) and can be used jointly with TIAL-P twocomponent solvent free wet epoxy primer to form three-layer corrosion protection system. When the tape is being heated, the backing of the tape shrinks, the adhesive layer softens and fills in all the irregularities to constitute a uniform coating and provide with excellent peel and dielectric strength of the coating. TIAL-L tape is delivered in 30, 40 or 50 running meter rolls. The primer is supplied in containers sufficient for coating of 1, 3 or 5 square meters of pipe surface. This packing is cost-effective for insulation of long bends or straight pipeline portions. Recommended dimensions of TIAL-L tape and consumption of the product depending on pipe diameter are listed in Table 3. If different diameters are used please contact TIAL to obtain specific figures. Dimensions of the tape can be changed according to customer request. Lifetime of TIAL-L tapes is minimum 45 years. 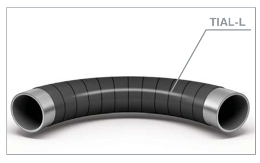 For coating of bends or straight pipes of large diameters it is possible to install TIAL-M heat-shrinkable sleeves. In case of TIAL-M choice the overlap to be at least 75 mm. * Standard thickness can be changed upon request. Can be changed upon request. ** Standard width 80, 100, 125, 150 and 200 mm.